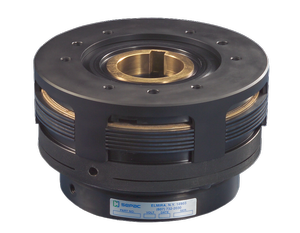 This SEPAC rotating field multiple disc clutch is designed to operate both dry and in oil. No bearings are used. Current is supplied to the magnet body coil by an electrical brush through a slip ring. (Grounding is accomplished internally through the magnet body to the machine shaft.) Many options are available. When current is applied to the coil in the magnet body, a magnetic field is created which attracts the armature toward the magnet body face. This causes the outer disc to be squeezed between the inner discs and the torque is transmitted from the input (magnet body) to the output (spider).